I came across this story will paging through the Sunday paper (yes, I still read the physical paper -- there's something about ink-covered fingers and the satisfying crinkle of turning pages I'll just never get over): Mobile app would turn writing into a game. What's this? Writing stories can be a fun, carefree activity* enjoyed between friends on the convenience of their cell phones? Brilliant! 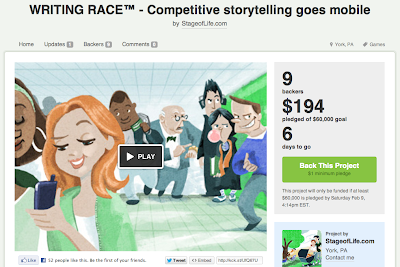 Dallastown resident Eric Thiegs -- CEO and co-founder of another cool writing website (Stage of Life) -- is raising money on Kickstarter to build an iPhone app called Writing Race. "Players will take turns with friends writing a story on their mobile phones - three words at a time – only they must do it as quickly as possible! The story shouldn't be sacrificed, and spelling is an essential part of the scoring system. Pressed for time and racking their brains, players will test their wits and exercise their creativity as they write a story, turn by turn. (In the “free write” mode, timers and scores are turned off, allowing friends to write together without the pressure of a ticking clock—many may find that even more fun.)" I love the idea of an app that encourages collaboration and creation for entertainment purposes while sneaking in a little brain workout. I imagine that's like Holy Grail of every English teacher in the universe (yes, even alien English (Vulcan? Romulan? Wookie?) teachers are raking their brains for ways to engage their young padawans)**. I think there should also be an Autocorrect mode, in which stories take on Mad-Libs-esque hilarity by allowing your phone to guess what you really wanted to say. (Seriously, phone when I type "Lily" I don't mean LOL. Stop trying to acronym everything. (There I go verbing nouns again. hehehe). Anyway, if they ever develop this app for Android phones, I'd totally download it. Since I barely have time to think beyond three words at a time anymore, it might be the only fiction I ever write! 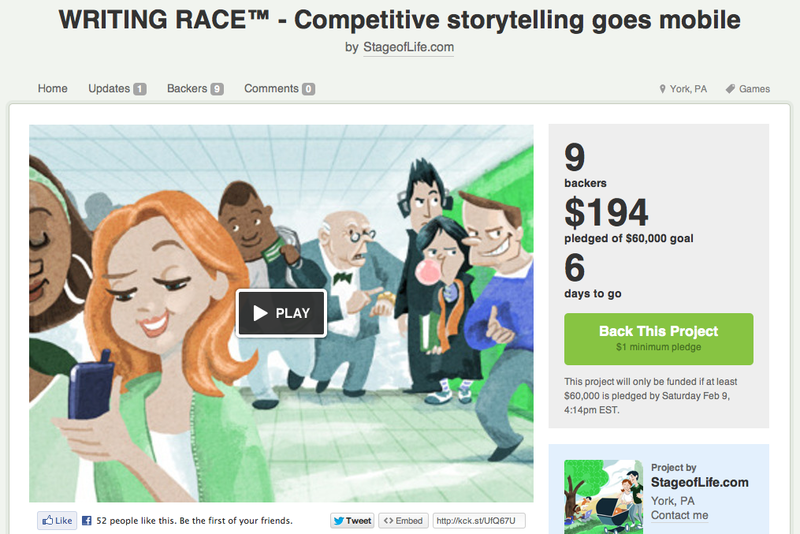 There's just six days left to back the campaign if you want the app to exist. Brad's awesome story connecting the Super Bowl to literature, history and avian enthusiasts. My latest Smart column about sibling rivalry (revelry?) in which Lily goes all Daffy Duck on her sister -- but then secretly likes her, too. * You know, instead of the frustrating, solitary mental slog that you drag yourself through in the hopes that you uncover even just one inspired/thought-provoking/original sentence. ** That was an aside within an aside. Do my digressions know no boundaries? ?